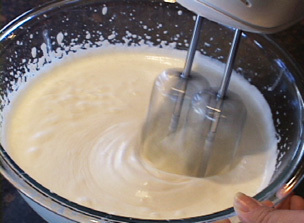 RecipeTips.com's video demonstration, 'How to Make Whipped Cream,' is an easy-to-follow guide for making whipped cream. Hi! This is Laurie from RecipeTips.com, and today we are going to be making homemade whipped cream. When making whipped cream, you want to make sure that the equipment that you are using is as cold as you can possibly get it, so place your bowl and the beaters into the freezer until just before you are ready to use them, and make sure your heavy cream is as cold as possible. Start by pouring your heavy whipping cream into your chilled bowl. I am using two cups of heavy whipping cream. Now, the bowl that you use, you want to make sure that it is large enough to handle the cream as it doubles, and usually when you are making whipped cream, it will double the amount of the cream that you are using. Begin by beating on low speed for thirty seconds, just until bubbles start to form. Once the bubbles start to form, you will want to increase your speed to medium until you start to see the cream thicken a little bit and a trail will be following the beaters. This is the trailing that you are looking for. As the whipped cream thickens up, it will start to follow the beaters. This might take a little bit more time, depending on the amount of the whipping cream that you are using. This took us probably three minutes to get it to the trailing stage. When it gets here, turn your beaters on high, and continue to beat until, just before soft peaks form. Right before the soft peaks start to form, you want to go ahead and add in two tablespoons of sugar per cup of whipped cream, so I have four tablespoons of sugar and also, one teaspoon of vanilla extract per cup, so I have two teaspoons of vanilla. And, you are going to want to beat this on high again until right before the hard peaks start to form or until it is the consistency you are looking for. This cream has been beat to the stiff peak stage. Now, this is perfect if you are going to use it for topping on desserts or salads, but if you want to use it to fold into a recipe, you will want to stop at a soft peak stage. When you get to the point where you want, go ahead and stop beating, because this cream will separate if you over beat. At this point, the whipped cream is ready to use, or it can be stored covered in the refrigerator for up to twenty-four hours. For more how to information, visit RecipeTips.com.